I am currently a research fellow in the Centre National de la Recherche Scientifique. I am working within GIPSA-lab , in collaboration with Pierre-Olivier AMBLARD , Ladan AMINI, Marco CONGEDO, Cedric GOUY-PAILLER, Christian JUTTEN, Bertrand RIVET and Marc SATO . 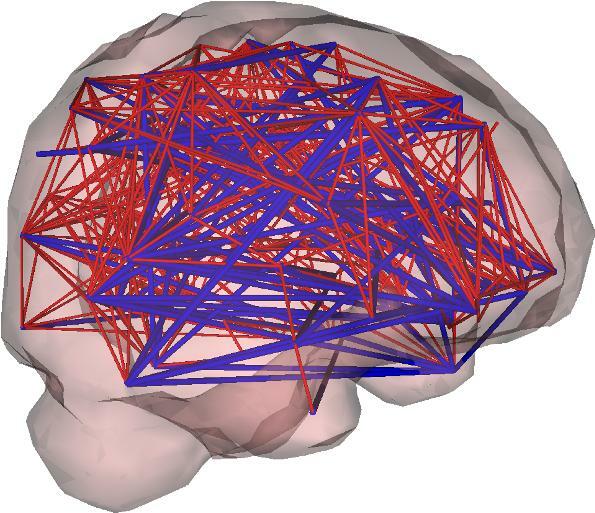 Now, I am leading my research on the characterization of connectivity between regions of the brain. Important issues arise from this problem, both in statistics and signal processing. From Magnetic Resonance Imaging, we get 90 time series that represent the hemodynamic response for each of the 90 regions in the brain. The objective is then to quantify the correlation between each region and to construct short and long range dependence. But, it is well-known that estimation of correlation between time series is very complex, especially when there is no straightforward modelling of the time series. That is why, the use of wavelets decomposition allows to get a time-scale representation of each process. This new decomposition leads to a characterization of high and low frequency phenomena. NEW !!! R package brainwaver. My PhD subject consisted in studying statistical methods for doing source separation in nonlinear mixtures. I have completed my PhD thesis in Laboratoire de Modélisation et de Calcul and in the University of Joseph Fourier Grenoble, France. I was working under a joint direction by Dinh-Tuan PHAM and Christian JUTTEN. Some simulations in blind source separation.